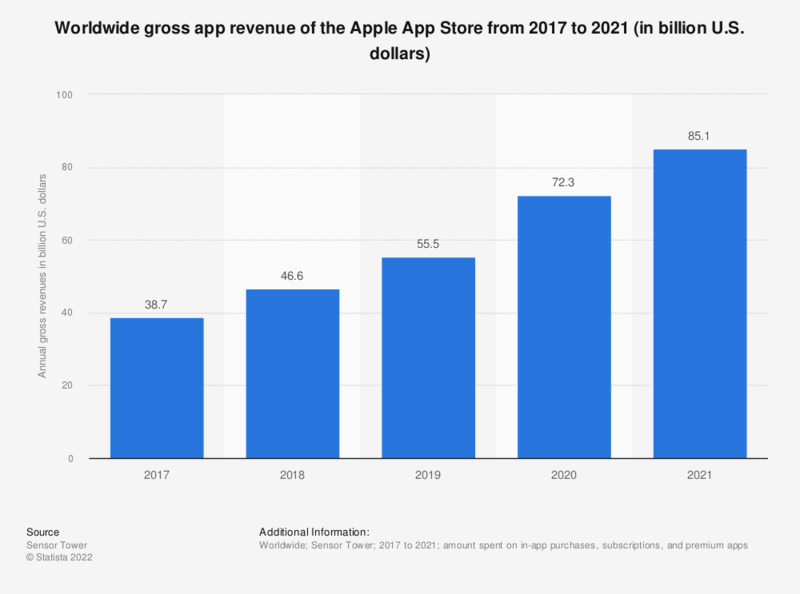 This statistic presents the annual gross app revenues of the Apple App Store from 2017 to 2018. In the last reported year, customers spent an estimated 46.6 billion U.S. dollars on on in-app purchases, subscriptions, and premium appsin the Apple App store. The App Store was launched in 2008 to coincide with Apple’s iPhone 3G release. Apps can be downloaded directly to iOS devices such as the iPhone smartphone, the iPod Touch handheld computer, and the iPad tablet computer, or onto a personal computer via iTunes. Many apps are available for free or utilize a freemium payment model, which allows the user to download the app without upfront costs but generates revenues through in-app payments. At present, the average price of apps and games is approximately one U.S. dollar. The most popular monetization models according to global app developers are advertising and contract work, with paid downloads ranking just third. The most popular app categories are gaming, business, and education, followed by lifestyle and entertainment apps. The most popular iOS apps worldwide are Facebook, YouTube, and Instagram. In Apple’s fiscal period Q4 2018, the company sold 46.9 million iPhones and 9.67 million iPads.